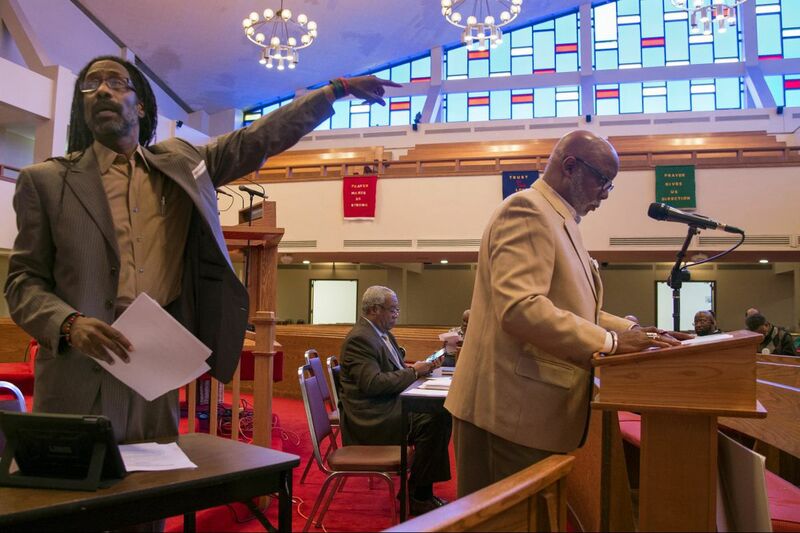 Attorney Michael Coard (left) leads a meeting at Zion Baptist Church June 5, 2017, to mobilize the African American community to resist "by any means necessary" efforts to destroy or diminish Cheyney University, the country's oldest historically black institution of higher education. At the lectern is Junious Stanton, former Cheyney University Alumni Association president. Alphonso Coleman, national alumni president of Cheyney is at rear center. Has Cheyney University been given a lifeline or death sentence by a task force that recently proposed a host of reforms to overhaul academic instruction, business operations and fiscal management? That question was on the table Monday night during a public meeting at Zion Baptist Church, 3600 N. Broad St., on saving the nation's oldest historically black college. Many of the roughly 125 people who attended the meeting were Cheyney graduates who came filled with worry and rumors of doom for the once-thriving institution whose graduates include civil rights pioneers Octavius Catto and Bayard Rustin, and CBS newsman Ed Bradley. "The plan is a disaster," said attorney Michael Coard, a 1982 Cheyney alumnus and co-founder of Heeding Cheyney's Call, which convened the meeting. While conceding that Cheyney has the lowest student enrollment and the highest budget deficit in its history, Coard said the recommendations of the state-appointed task force would be counterproductive. He said the university's financial problems were the result of the state under-funding the institution by a total of $100 million since 1999. "Do you resolve [the problems] by selling off its resources or adding more resources? Do you increase the school by cutting sports or adding sports? Do you knock down buildings and cut staff? Of course you don't. So, our position is that we want to force the state government to do the right thing," Coard said. The task force that produced the report was created by the Board of Governors of the Pennsylvania State System of Higher Education. Released last week, the report paints a grim picture of Cheyney's current state while proposing an array of overhauls to put the struggling university on sound footing in the future. Situated on 275 acres of farmland in Delaware and Chester Counties, Cheyney has just 746 students, which represents a 53 percent decline since 2010, according to statistics from the state system. Currently, only 7.9 percent of students graduate in four years, and 17.5 percent graduate in six years, according to the task force report. Financial stability has been elusive, with the university running an operating deficit since fiscal year 2011-12. To meet basic cash flow needs. the university has had to rely on $30.5 million in credit from the state system, the task force report noted. That non-academic administrative and financial functions be outsourced to other universities and organizations. "This approach is consistent with national models for smaller institutions, which allows the university to concentrate its efforts on what matters most — teaching and learning," the report said. Paring down the number of academic majors to no more than 12. Currently, there are 17. Organizing academic programs into four cluster areas, each with shared major and foundation courses, and each to include a first-year experience course for freshmen. Closing buildings for greater efficiency. Conducting a feasibility study on selling and leasing university land. Ending NCAA sports programs. "At Cheyney's size, costly NCAA Division II sports programs are difficult to justify and would be eliminated," the report said. "My main concern is I don't want them to sell the land. I know there has to be collaboration with other universities, but Cheyney is the first historically black college, and we need to do whatever we have to do to keep it open," said Karen Shanks, 69, a 1970 graduate and retired teacher from the School District of Philadelphia. Jamere Lawrence, 30, a business administration major who graduated in May and will begin a managerial job with Hilton Hotels in Columbus, Oh next month, said he came to the meeting to learn what he could do to help Cheyney survive. "I'm very concerned that the school could be in grave danger," he said. "I want the school to stay around so it can afford other students the same opportunities that it gave me." City Councilwomen Jannie Blackwell gave words of encouragement to the Cheyney supporters, while Karen Warrington, communications director for U.S. Rep. Bob Brady, said the congressman was prepared to help once the alumni decide a course of action. Meeting organizers asked those in attendance to make known their objections to the task force recommendations of selling land, closing buildings, laying off staff, and cutting sports. "We've been through hurdles before, and this is just another one that we have to push to get over," said Taliya David, 30 a 2009 political science major graduate and current public administration graduate student. Guided by the task force report recommendations, Cheyney's administration has been charged with developing a detailed business and academic plan that must include an updated academic array, organizational chart, facilities plan and a multi-year operational budget, the task force report said. Cheyney Interim President Aaron A. Walton, a former executive with Highmark Inc., who was appointed last week, could not be reached for comment Monday.